Blanco is renowned for his benevolent nature and willingness to engage in Good Works, especially the healthful encouragement of youth (or what employers insist on calling ‘community engagement’, or even worse, in the university sector ‘impact factors’ – I can barely believe I am saying this) so it will come as no surprise to learn that my visit to the Zapotlanejo High School was a resounding success. Despite admitting to a certain nervousness in my last post, once the nettle was grasped – or the cactus, more appropriately – everything went swimmingly. First I had to meet the mayor of this small provincial town for handshakes and the obligatory photo session, and received a gift of a history book detailing the beginnings of the Mexican revolution – the war of independence against the Spanish – which was fomented in this region, we set off for the school, where, escorted by two stunningly elegant pupils garbed in regional costume, and to a deafening fanfare of trumpets, such as greets the toreador entering the bullring (I kid you not dear reader) I was introduced to my audience of 16-17 years olds.. The reality was far more pleasant than a corrida, and less bloody. After the usual embarrassing introduction, from the headmaster, I managed to blather on fitfully in Spanish for twenty minutes on the theme of ‘being a writer’ or ‘how I became a writer’, and read a couple of poems, which the English teacher, Carlos, delivered in translation. By which time I felt I’d said enough and opened it up to the floor, rather a dangerous move considering the reluctance of teenagers to be seen to respond positively under these strenuous circumstances. But they reacted marvellously, humouring me – or perhaps even taking pity – by bombarding me with civil, intelligent and even (from one gangster youth near the back) with considerable wit. The most astute question came from a young fellow in a hoodie who asked, more or less, ‘how do you know, when you get to the end of a page, that the words you have chosen are the right ones?’ Most of the kids laughed at him, but I thought it was rather perceptive, and said dammit, that’s what bothers me all the time, jolly good question my lad. So all the kids who had laughed were then booed by the kids who liked the hoodie kid. And so on. We all had a grand time. 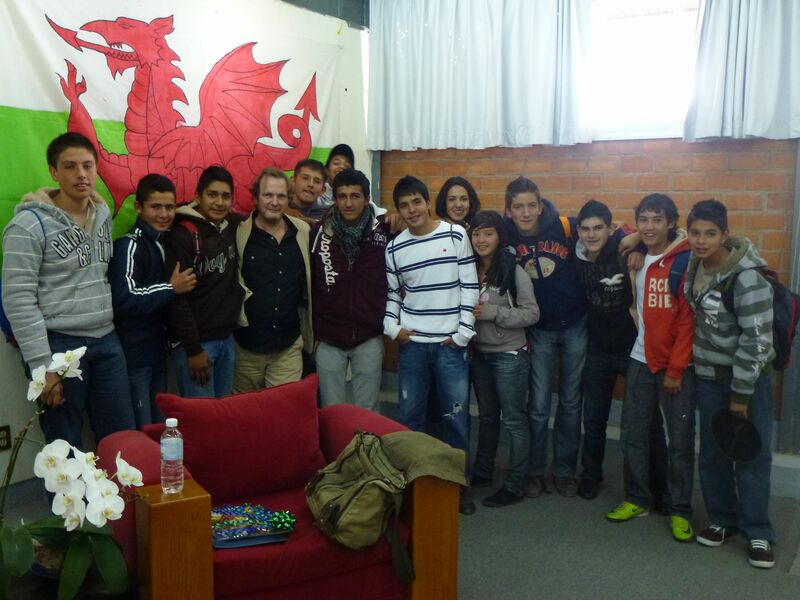 They had even made a Welsh flag especially for the occasion and some of my new fans posed with me for a picture afterwards. 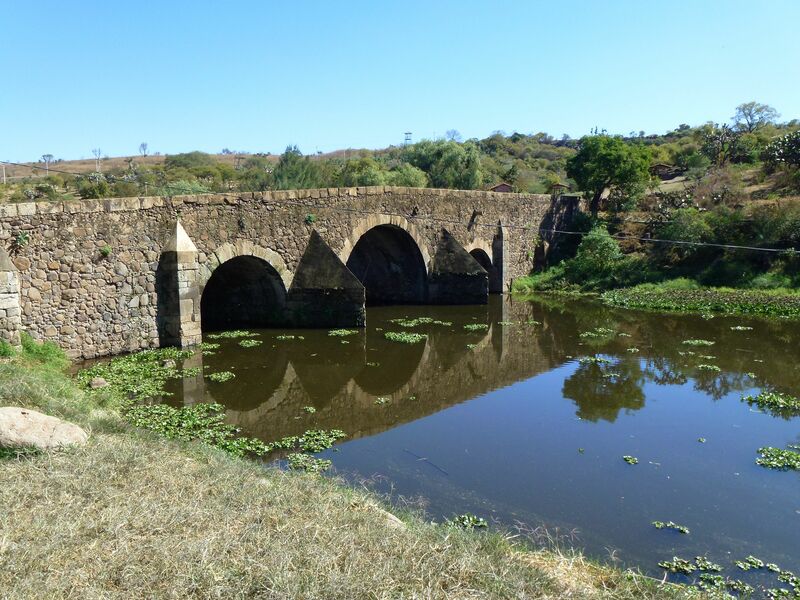 My hosts insisted on taking me to a nearby Place of Historical Importance, where the first major battle of the war of independence took place, at Puente de Calderón. There, beneath the blazing Jalisco sun, I found out about the details of the conflict, explained to me by Carlos, and when I clambered through the scrub to take a picture of the bridge wondered if there were rattlesnakes – I was assured there were – and wondered yet again at the indefatigable capacity of our species to slaughter one another without respite. 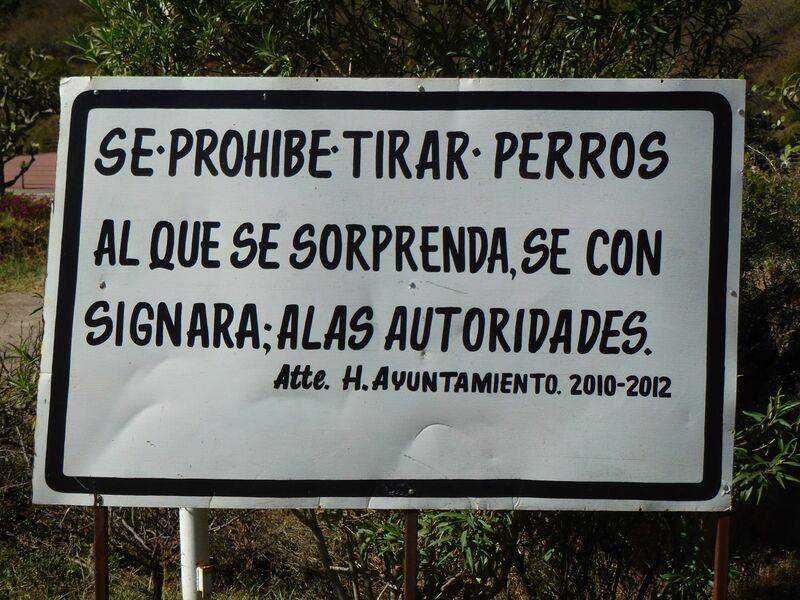 I also discovered a new addition to my collection of weird signs, which reads ‘Se prohibe tirar perros’, literally, ‘it is forbidden to throw dogs’, or less literally, to take them to the park and leave them there, a horribly cruel thing to do in any case, but one which encourages the formation of packs of feral dogs who then start to become a menace, as well as shitting everywhere, as Carlos explained. While there, we bumped into the local captain of police, a short but very well-built gentleman with many gold teeth. We fell into conversation and he explained to my hosts about a recent raid that he had led, and which had featured in the news. It involved an organised assault on a drug manufacturing laboratory and resulted in many arrests and a number of deaths. When they had finished, he told us, without any sense of false modesty or exaggeration, the ground outside the laboratory was carpeted with thousands of empty cartridges. He actually seemed a mellow-mannered, thoughtful fellow, but I wouldn’t want to get into a gunfight with him. ‘Mexico is a country of many faces’, said the history teacher, as we walked back to the car. 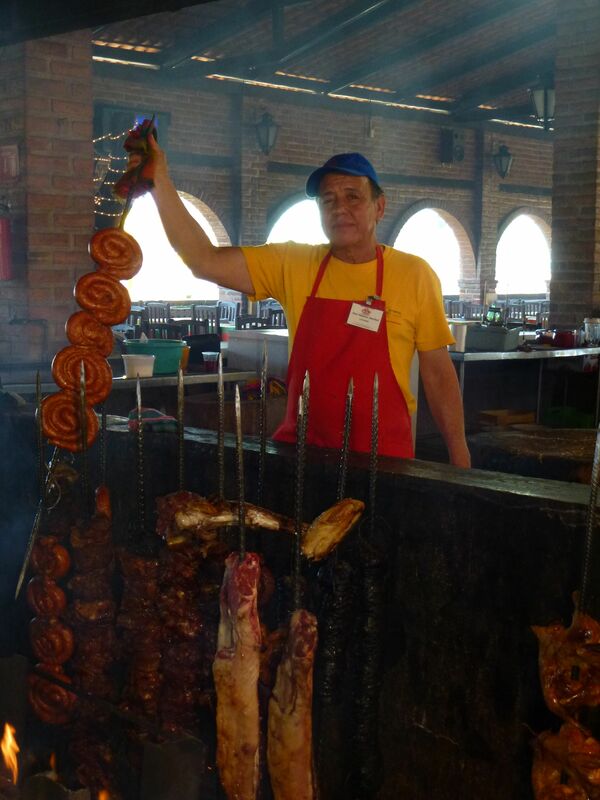 So, my respects to local culture completed, we set out to eat at a fabulous restaurant where great slabs of meat and half sheep were skewered and cooked around a blazing fire of oak. 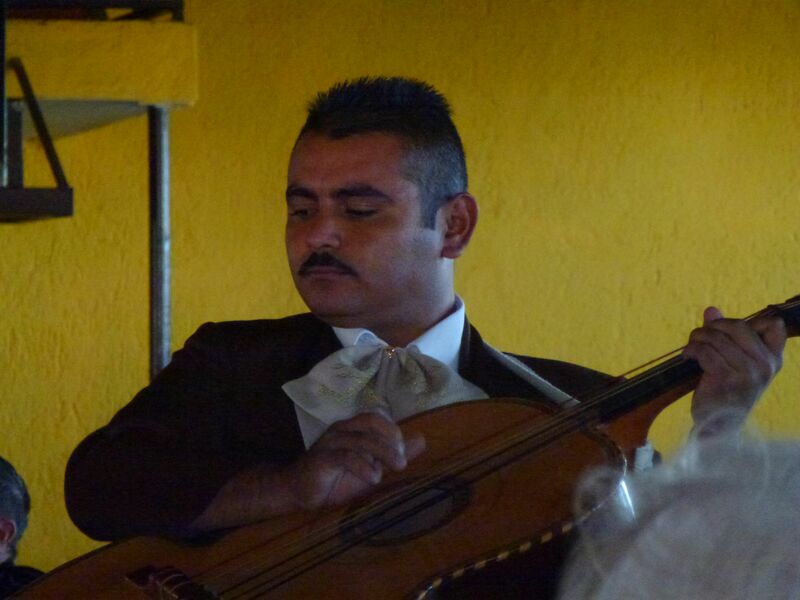 We ate and drank to the tuneful accompaniment of a mariachi band. 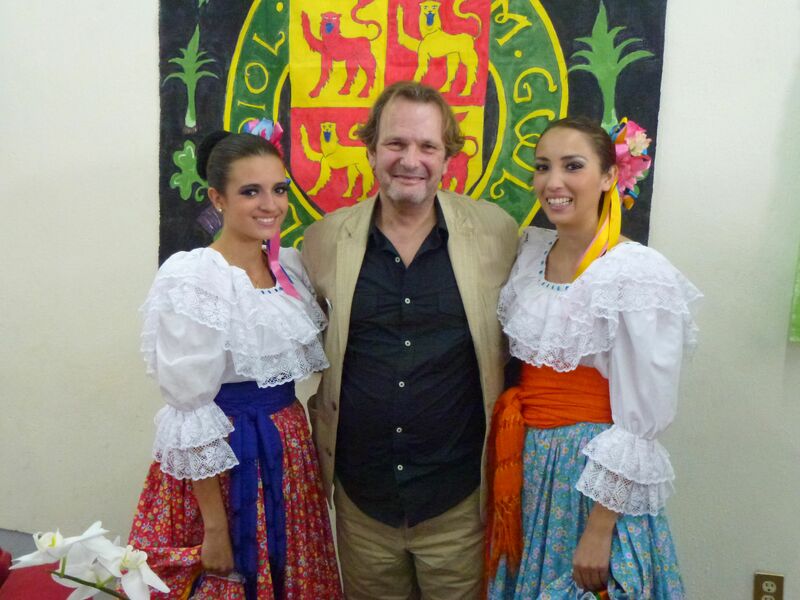 Then it was all over and I had to return to Guadalajara to conduct Literary Affairs and to star in an event called La Mirada del Vagabundo or ‘The Gaze of the Vagabond’. It was only when the event had ended and people started to queue up to buy signed copies of said book that I realised I ought to have brought some with me. Oops.